When you first glimpse the brand new city of Songdo, an hour's drive from Seoul, it's hard not to be seduced by the glitzy skyline. The façade of the 68-story North East Asia Trade Tower glitters in the sun. The nearby Songdo Convensia, with its folded roof planes reminiscent of the Sydney Opera House, is a state-of-the-art convention center boasting one of the largest column-free spans in Asia. "Ten years ago this was still under water," recalls Scott Summers, vice president of foreign investment and marketing at Gale International, as he points out high-rise buildings behind his back from a steel footbridge that winds its way through Songdo Central Park. The New York-based real estate development and investment firm began to cooperate with the Incheon Free Economic Zone Authority in 2001, becoming the major real estate developer in Songdo. Among the projects realized in cooperation with domestic partners are the 54,000 square meter convention center and Songdo Central Park. The Next Northeast Asia Hub? "This is only 50 percent completed," notes Summers. When the entire district is finished in 2020, the local population is expected to increase from 70,000 today to 250,000 residents. Since 2003 South Korea has successively established six "free economic zones" including Incheon, Busan Jinhae and the Gwangyang Bay Area. The objective is to turn South Korea into the commercial hub of Northeast Asia by 2025. 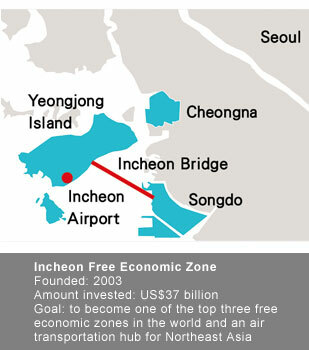 Without a doubt the Incheon Free Economic Zone is at the core of this strategy. With a surface area of 170 square kilometers, the Incheon zone is 1.5 times bigger than Hsinchu City in northern Taiwan and includes Songdo, Cheongna and Yeongjong Island. It hosts Incheon International Airport, a financial district, residential areas as well as recreational and entertainment facilities. 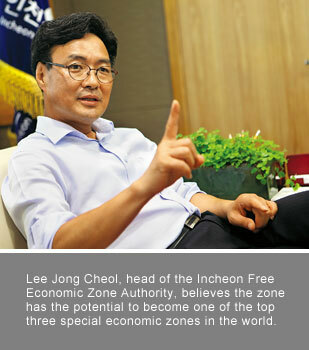 Seoul's goal is to create one of the world's top three free economic zones. In the Incheon zone US$37 billion were poured into basic infrastructure alone, an amount more than double the total cost of Taiwan's Taoyuan Aerotropolis project. Incheon's development model differs from that of other special zones. The land for Songdo was reclaimed from the sea. Eight ninths of the land will be developed by the government and sold through presales before construction is completed, while the remaining one ninth of land is being developed by Gale International. "You don't see this kind of model anywhere else," remarks Jonathan Thorpe, senior executive vice president and chief investment officer at Gale International, with a laugh. "What makes it unique is its private-public partnership between the government and developer." Nonetheless, Incheon has suffered from "growing pains" from its very beginnings. Amy Jackson, president of the American Chamber of Commerce Korea, clearly remembers the teething troubles of Incheon. When the zone was incepted ten years ago, non-transparent lawmaking, insufficient intellectual property rights protection, and inadequate industrial standards led to never-ending complaints from foreign investors. "It is very different from ten years ago," declares Jackson. Nowadays the South Korean government is quick to give feedback on investors' opinions. "Now I can reach the official in charge very easily with just one phone call," explains Jackson. When hearing that Taiwan is also planning to establish free economic zones, Jackson suggests that the government incorporate the ideas of foreign investors and proactively respond to their concerns starting from the planning stage. In order to demonstrate its resolve to attract foreign investment, the South Korean government has established a unique, dedicated ombudsman system. The ombudsman serves as a one-stop window for the consideration of foreign investor opinions. Investment-related disputes often involve several cabinet agencies. "With the ombudsman system in place, the investors don't need to turn to each individual ministry for help anymore," Jackson points out. The changes brought about by the free economic zones in South Korea translate into rising foreign investment. Taking Incheon as an example, the amount invested in the zone has jumped more than five times in the past three years from US$500 million to US$3.2 billion. Almost half of this investment is in semiconductors and industrial robots, whereas education, property development and biotechnology each account for a share of some 13 percent. Presently about 116 companies have moved into the zone, including more than 60 percent foreign companies. U.S.-based Amkor, a leading provider of semiconductor assembly, packaging and test services, has just announced that it will spend US$1 billion over the coming seven years to build an R&D center in Incheon. The center is expected to create 5,500 jobs in the zone. Over the past ten years, Incheon has overcome its teething problems and is seeing initial results. However, it will take another ten years to make the zone a resounding success. Due to the global financial crisis, Incheon failed to attract the targeted amount of investment. So far foreign investors have pledged just US$6.8 billion in investment, still a far cry from the originally projected target of US$40 billion. 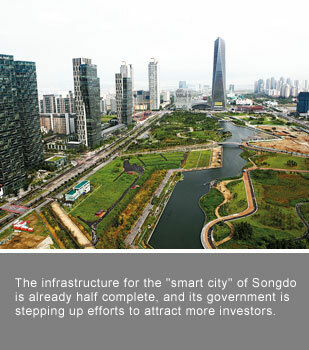 Therefore, all efforts now focus on developing Songdo into a smart city to fuel foreign investor interest. Songdo is not only the flagship project within the Incheon Free Economic Zone, it is also a showcase for South Korea to demonstrate the nation's ambition with regard to economic transformation. The most crucial point of consideration is: how to stand out amid fierce regional competition, and support the nation's core competitiveness. Wedged between China and Japan, South Korea is under competitive pressure. China's Tianjin Binhai New Area, facing the Korean Peninsula on the far side of the Bohai Sea, is a permanent reminder that South Korea's neighbors are in pursuit of equally ambitious development schemes. Thirteen times bigger than Incheon, the Tianjin Binhai New Area is known as the "third growth pole" of the Chinese economy alongside Shenzhen and Shanghai's Pudong District. Surrounded by formidable rivals, the ten-year-old Incheon zone needs to switch strategies to thrive in the coming ten years. The new strategy is pooling and concentrating resources in the high-tech industry, South Korea's most competitive sector. "We have a clear strategy. We want to focus on companies that are doing high-tech, research and development, and high added-value," explains Incheon Free Economic Zone Authority (IFEZ) Commissioner Lee Jong-Cheol. Countries around the globe are establishing special economic zones to attract investment. This also goes for Incheon, but the IFEZ Authority takes a somewhat different approach. "We aim to provide the only truly international environment for our residents," Lee asserts. The first step in creating a world-class living environment is transportation. Incheon already has a superior road and traffic system. But efforts don't stop there. The South Korean government poured US$1.4 billion into the construction of a highway bridge that links Songdo with Incheon International Airport. Stretching 12.3km across the Yellow Sea, Incheon Bridge is 21.38km in total length.It opened in October 2009 after five years of construction, shortens travel time between the two locations by one hour to just 30 minutes. Furthermore, a new subway line will be built within six years to directly link Seoul with Songdo. This will cut short travel to and from Seoul by one hour, bringing the capital into daily commuting distance. A green living environment is another plus most special economic zones rarely offer. Songdo Central Park covers an area of 41 hectares, about 1.6 times the size of Taipei's Daan Forest Park. Forty percent of the city's area has been reserved for greenery, more than eight times as much as in Taipei City. About 100km of dedicated bicycle lanes crisscross the district. Mr. Kim, a recreational visitor from Gyeonggi-do, the province surrounding Seoul, is riding a tandem bike with his children. As they stop to rest and drink some water, Kim explains what brought him here: "I like the architecture and the park here. You can't find this anywhere else in Korea." Habitable cities also need good schools and education facilities. And a number of international universities have already arrived on Incheon's doorstep. Last year SUNY Korea opened its doors in the zone, under the auspices of Stony Brook University (part of the State University of New York system), and it is currently recruiting students. Next year, the University of Utah, George Mason University and the leading Belgian university, Ghent University, will follow suit. On top of that, Songdo, which prides itself on being the world's first "smart city," will also make digital technologies an integral part of its residents' daily life. Yoon Chang So, smarter city country leader at IBM Korea, points out that Incheon is experimenting with a traffic forecasting system on top of an already existing smart public transportation system and real-time road traffic information system. The IBM team plans to pool and integrate all transportation-related information such as concert dates or planned construction sites to forecast the road traffic situation several hours or even up to one week ahead of time. "With the forecast ability, citizens can avoid those sections with traffic jams; this is an unprecedented attempt," So says. What makes Songdo attractive is that it began from scratch, so that architects and designers have been able to give their creativity free rein. Late last year, the United Nations-run Green Climate Fund chose Songdo as the seat of its permanent secretariat, passing over five strong competitors. Next to Central Park, Songdo Convensia with its glittering, sculptured roof epitomizes the district's modern architecture. The environment-friendly convention center was designed by renowned Korean architect Yoo Kerl who also masterminded Seoul's futuristic New City Hall. Local officials have set their sights even higher. "Songdo will be surrounded by seawater; this will be the Venice of Asia," enthuses Lee, his eyes radiating excitement. "There are more and more homebuyers looking to set foot in Songdo," observes Bora Lee, PR team manager with the Incheon International Airport Corporation. Located right opposite of the Hilton Hotel is the district's currently most expensive residential complex, yet apartments there cost less than half the price of an average flat in Seoul. Bora Lee believes homebuyers "see the potential there." Looking down from the 30th-floor office of the Incheon Authority, it becomes clear that the district is slowly taking shape. Asked when his "Venice of Asia" vision will become a reality, Lee laughingly admits that this might take another twenty or thirty years. "Maybe by that time I am no longer the commissioner, but with the right direction, I am sure they will realize my goals," he asserts. The resources and infrastructure needed to make the Incheon dream come true are already half complete. South Korea clearly has sufficient strength, stamina and self-confidence to meet the tough challenges ahead, as the competition among special economic zones in Northeast Asia reaches the boiling point.